I have spent the last two weeks discovering Obeo Designer 5.0 and working on the videos which will be available on the new website (www.obeodesigner.com). This new version is going to be officially released in ten days, so each minute counts! 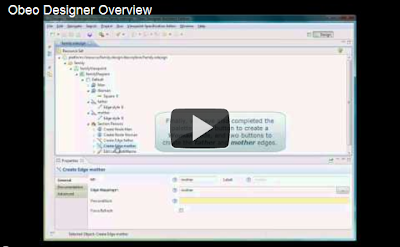 Obeo Designer is a tool which allows to create specific modelers in Eclipse. It is based on EMF, GMF and Acceleo. I have been very impressed by the ease and rapidity for creating my first designer. Of course I'm familiar with Eclipse and EMF, but I had never developped with GMF before. In one day, starting from scratch, I have been able to create my first designer, with several layers (to optionally show or hide some kinds of relations) and a table (to represent my model with lines). For the demos, we have volontarily chosen a very simple example to illustrate the Obeo Designer approach. With this example, the concept of Family (men and women related by parental relationships), each Obeo Designer functionality can be easily described. I have posted the first video today. It is a first overview which explains, in five minutes, how to create a first modeler with zero code and zero deployment. Other videos will come soon to demonstrate the other functionnalities. Stay tuned!